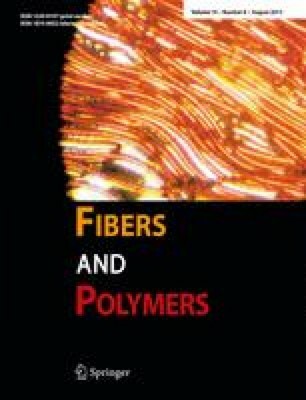 In order to investigate psychoacoustic characteristics of fibers, and to compare them with sound physical parameters, each sound of 25 different fabrics consisted of a single fiber such as wool, cotton, silk, polyester, and nylon was recorded. Sounds of specimens were transformed into critical band diagram and psychoacoustic characteristics including loudness and sharpness for each sound were calculated based on Zwicker’s models. Physical parameters such as the level pressure of total sound (LPT), level ranges (ΔL), frequency differences (Δf), AR coefficients (ARC, ARF, ARE) were obtained in fast fourier transform (FFT) spectrum. Nylon taffeta showed higher values for loudness than 2.5 sone corresponding to human low conversation, while most silk fibers generated less louder showing lower values for loudness than 1.0 sone. Wool fibers had higher loudness mean value than that of cotton, while the two fibers didn’t differ in LPT. Loudness showed high positive correlation coefficients with both LPT and ARC. Sharpness values were higher for wool fiber group than other fibers. Sharpness was not concerned with loudness, LPT, and ARC, but the fabrics with higher values for sharpness tended to show higherΔL.